Prince Albert, the fourth child of Queen Victoria and Prince Albert, had set his eye on the 17 year old Grand Duchess Marie Alexandrovna. But everyone seemed to be against the match. Marie Alexandrovna didn’t want to leave Russia. Her parents weren’t keen on that idea either. They much preferred to keep their daughter close. And Queen Victoria would absolutely never consent to her son and his wife to live in Russia, a country she never particularly liked. It seemed to poor Alfred that he would never get his wish. But about three years later, things changed. The Tsar’s mistress bore him a son, which created a rift between him and the rest of his family. Family life was becoming hell, and Marie seriously began thinking about marrying Alfred and moving abroad. 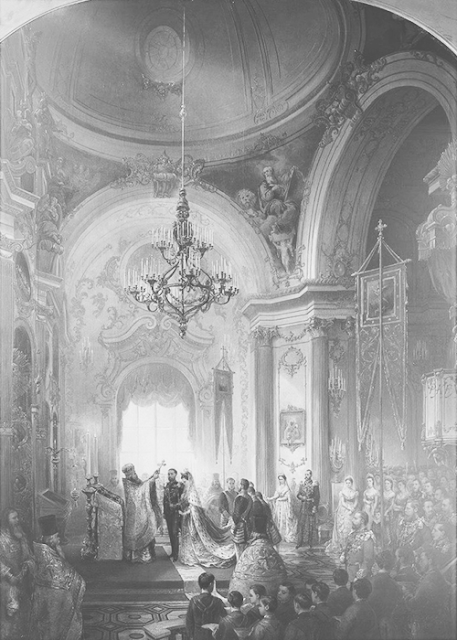 The couple got married at St. Petersburg on January 23, 1874. Two religious ceremonies were performed, one Orthodox and one Anglican. Marie walked down the aisle dressed in a gown with a silver train and a purple mantle trimmed with ermine, as was customary for Russian imperial brides. On her head, she wore both a sumptuous tiara with pink diamonds and a sparkling crown. She looked “very pale but sweet and earnest and calmly happy”. But for her father, it was a bitter-sweet occasion. “It is for her happiness, but the light of my life is gone,” the tsar was heard saying. Alfred and Marie stayed in Russia for several weeks before leaving for England. But their marriage, which looked so promising at the beginning, was an unhappy one. To add insult to injury, it didn’t even improve Anglo-Russia relations, as it was hoped.